It was more than 50 years ago that Marvin Gaye crooned “ain’t nothing like the real thing,” but from a marketing standpoint it might as well have been yesterday. In that memorable lyric was a lesson for online brands: There is no substitute for experiencing something in real life. There is no substitute for experiencing something in real life. Many digitally native companies figured that out a while ago, hence the growing number of pop-up shops, stores-within-stores, showrooms and even permanent shops in recent years. These brands hope that they can convert online success into physical foot traffic and that by allowing customers to experience and better understand their products that foot traffic will, in turn, fuel online sales. Take Warby Parker as an example. When the hip online-eyeglass brand launched its sample-your-frames at home service in 2010, the concept was revolutionary. But by 2013 they had opened a flagship retail outlet in their home base of New York City so that they could go head-to-head with offline retailers. By the end of 2018 the company will have nearly 100 stores across the U.S. Sales are one measure of success for these brick-and-mortar outposts—and successful they are, with the pop-up industry now worth $10 billion in sales, according to PopUp Republic. But these real-life stores are about much more than just moving merchandise. 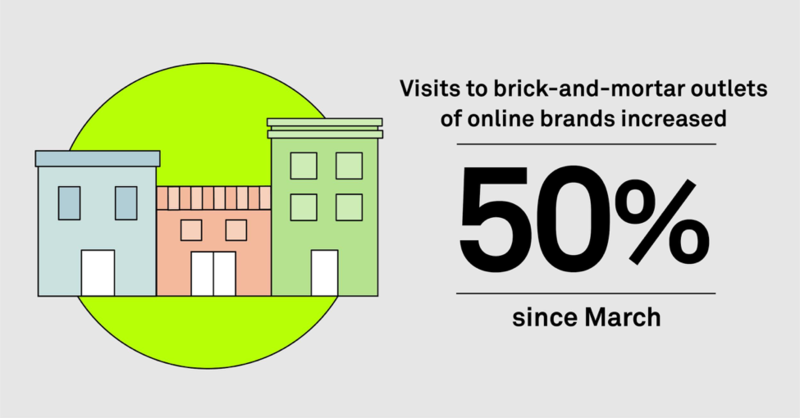 Through physical locations, online brands can create real-life experiences for consumers and allow shoppers to have more meaningful interactions with their products. By all appearances, customers value these physical connections with the brands they are interested in. GroundTruth foot traffic analytics data shows that, in comparison with traditional retailers, visits to the brick-and-mortar outlets of online brands has increased an average of 50% since March. And that matters. When it comes to these kinds of new stores, the number of visits is even more important than overall revenues and sales because of the relationship it allows customers to develop with your brand. But getting people in your newly erected door is one thing; getting the right people is another. To get the types of customers you want to target you have to start by being in the right place—say, downtown for a millennial crowd. That’s where location data comes in. By analyzing foot traffic, we can help retailers understand what kinds of people are visiting their stores—who they are and where and when they shop. Our data shows that jewelry shoppers, fast-fashion shoppers and shoe fanatics are the biggest frequenters of the physical outlets of online brands. Once you understand who your visitors are, you can figure out where would be the best place to open and determine the success of existing locations. We’ve seen, for example, that the best foot-traffic cities for Warby Parker are Washington, DC; Seattle, WA; and Tysons, VA.
Our foot traffic data can also help you measure the success of marketing campaigns and new product launches. For example, luggage company Away had a waitlist of more than 3,000 customers long for their new sky-colored line. 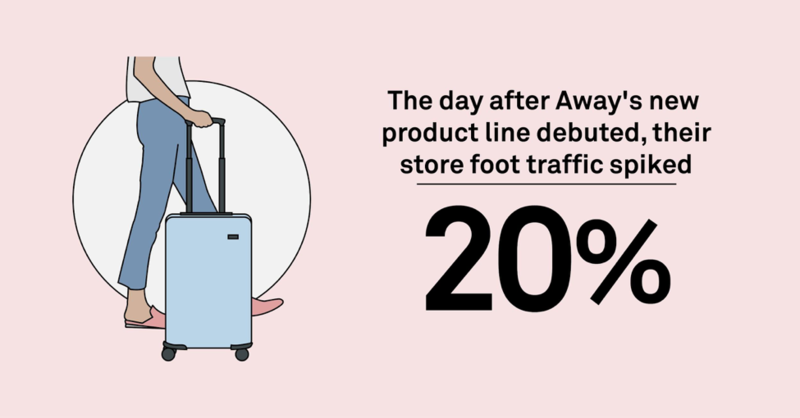 GroundTruth data showed that the day after the new product line debuted, foot traffic at the company’s stores spiked by 20%, proving that sometimes shoppers want the instant gratification that even overnight delivery services can’t provide. When it comes to online brands, the physical versus the virtual shopping experience is no longer an either-or proposition. When it comes to online brands, the physical versus the virtual shopping experience is no longer an either-or proposition. For today’s marketer, synergy between the two is key, and understanding consumer trends in real life are essential to delivering them the products and experiences that will earn their loyalty for life.